Engaging and entertaining. Knowledgeable and down-to-earth. Jim’s riveting presentations leave audiences spell-bound, with a renewed thirst for history, archaeology and the plight of the human race. 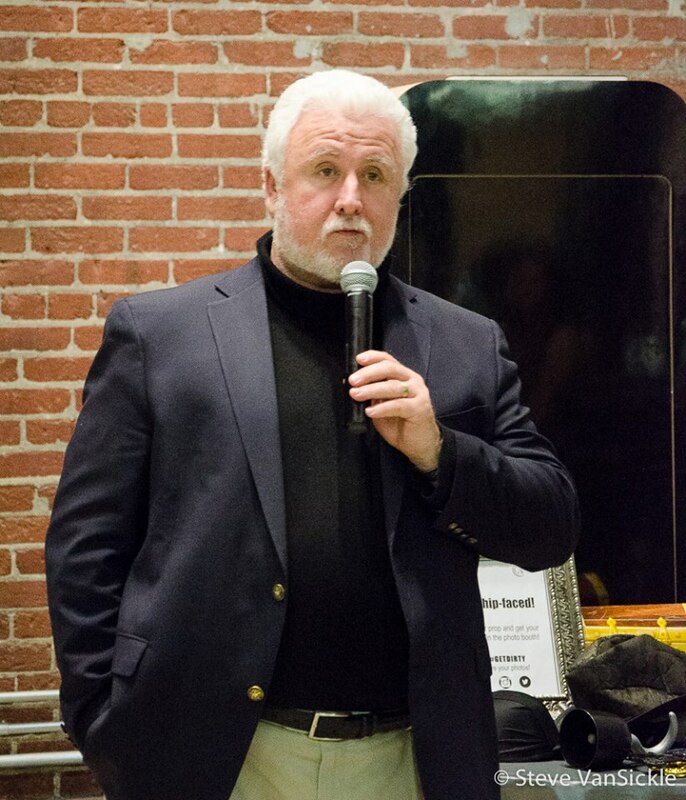 Jim can be booked for public and academic talks by contacting his representative, Cassidy & Fishman Inc.
Jim has been an invited speaker at conferences, media events and public presentations throughout his career. He has given hundreds of live presentations to audiences ranging from a few dozen to a few thousand. In this video, Jim gives an inspirational talk to a large audience at ideacity in Toronto, Ontario, Canada, on maritime archaeology today, its beginnings, and what we know about shipwrecks, technology, and the ocean. ideacity 2017 is described by CA TV’s “One” as Canada’s Meeting of the Minds. Produced and hosted by Moses Znaimer, ideacity is an annual conference in Toronto that gathers the most innovative people to say important things about the world. ideacity presents the best Talks of conferences past from giants like author Margaret Atwood, filmmaker Robert Lantos, social activist Henry Morgenthaler, media baron Conrad Black, astronaut Marc Garneau, and environmentalist Robert F. Kennedy Jr.
James Delgado’s presentation was excellent. I thought he hit the target for our audience, which consisted of 1500 people, mostly families. The program was very informative, and presented in a way that made people feel that James really appreciates what he is doing and enjoys sharing it with others. I heard the term “inspiring” by several people when asked how they liked the program. Jim’s public speaking career began at the same time the archaeology bug bit him – when he was a teenager. After taking every public speaking course he could in High School, a tenure on the debate team, Student Congress, and in extemporaneous public speaking competitions, Jim won the Optimist’s Club’s public speaking award in 1973 for a speech entitled “Listen, World.” The Optimists selected the title – Jim had to write and deliver a speech using that title as the guiding theme. Decades later, Jim cannot remember what he said, only the opening remarks – “Listen, World” with three loud knocks, a dramatic effect recommended by Jim’s father, Bob. It obviously worked. A second prize contest, a historical narration for the Native Sons of the Golden West, secured another prize in 1974. 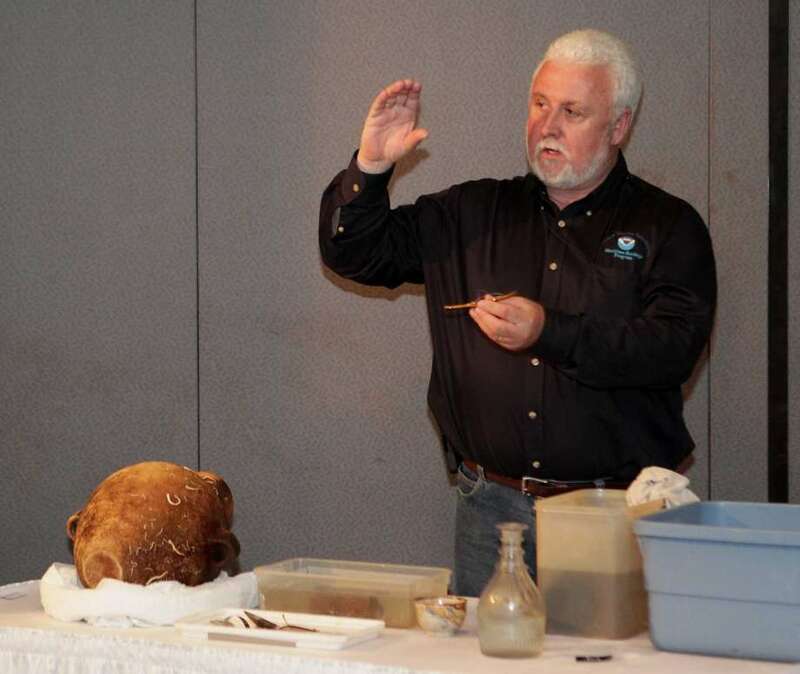 Thank you again for your fascinating presentation on the world of underwater archaeology. The examples you chose covered a broad spectrum of human history and … your personal involvement in these “finds” really added to the impact of this presentation on our members. Jim’s friends joke that all it takes is a nickel in his ear to get him to talk; actually he does for free, and often, to unsuspecting friends and family, who have learned 1) to never ask the open question, “what’s new?” or 2) “tell me about your latest project.” In all seriousness, Jim is highly sought as a speaker who also gives of his time to talk to or for disadvantaged youth or a few other causes near and dear to his heart like autism, cancer, or literacy. We are all very thankful for your contribution to the enrichment of our evening. Everyone thoroughly enjoyed your presentation and found your explorations and adventures fascinating. I am sure that every one of us dreams of being an undersea archaeologist – but you do it! And you do a masterful job at it. Jim’s presentations include illustrated talks on his adventures and dives, historical essays on subjects he has researched, such as Titanic, USS Arizona and the Pearl Harbor attack, the atomic bomb tests at Bikini Atoll, the quest for the Northwest Passage, or the California Gold Rush, to name a few. 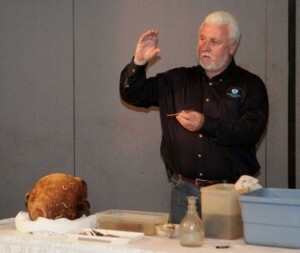 Jim has an innate ability to make history come alive while educating his audiences about many aspects of shipwrecks. The searching, finding and documentation of important archaeological evidence is critical for the history books, but it’s the lives that were forever interrupted or changed by these unfortunate events that Jim relays with poignancy and a deep respect for all those who have been lost at sea and their loves ones left behind.